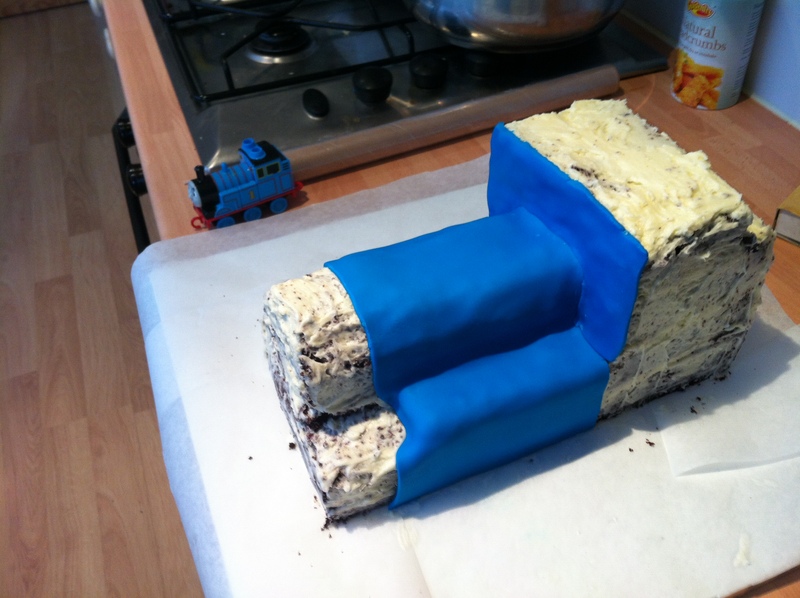 So here’s how Thomas was made. The cake is the chocolate fudge cake that I use for, well, pretty much everything – and the recipe is here. I used one and a half times the recipe, baking two square cakes in 11×11 inch tins. 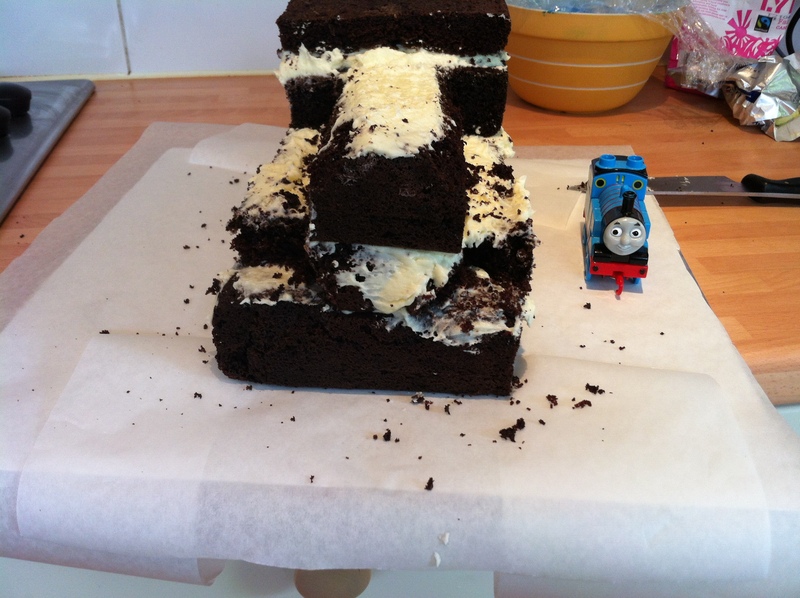 There is a fair bit of carving involved with Thomas, and a layer of crumbing frosting is essential. 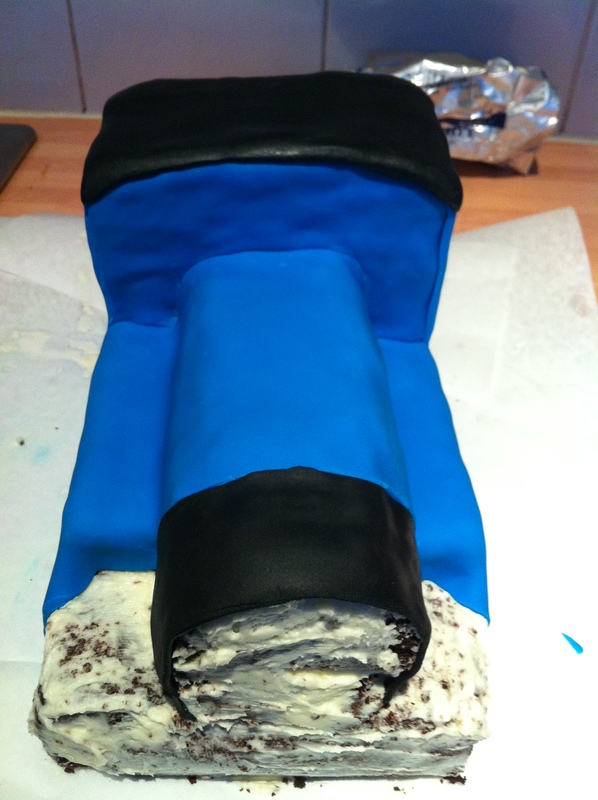 This layer is to prevent lots of crumbs spoiling the fondant finishing. 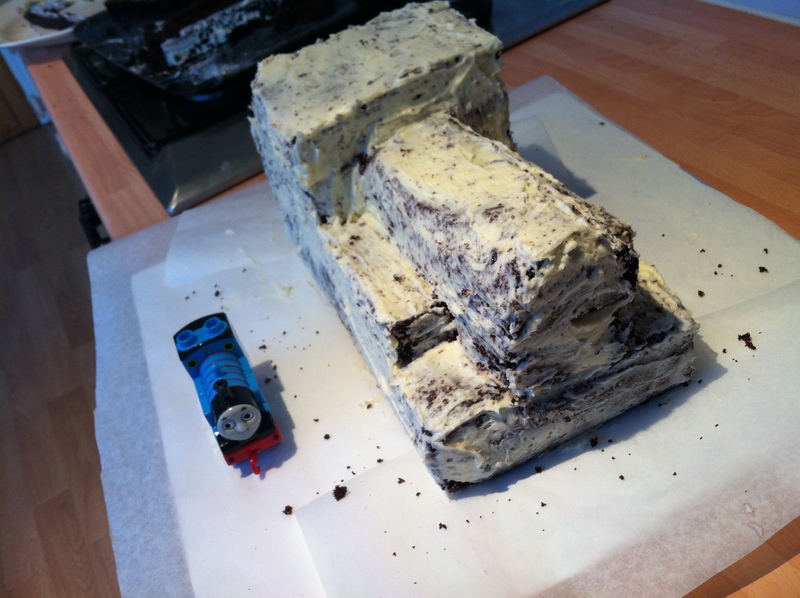 You can see the evolution of the shape of the cake in the photos below – two square cakes, cut in half and sandwiched together with layers of yummy vanilla butter cream frosting. Luckily you can see I had a Thomas toy to model for me! Carving the rounded front end is really the only slightly difficult part, as you can see the rest of the carving are just straight cuts. 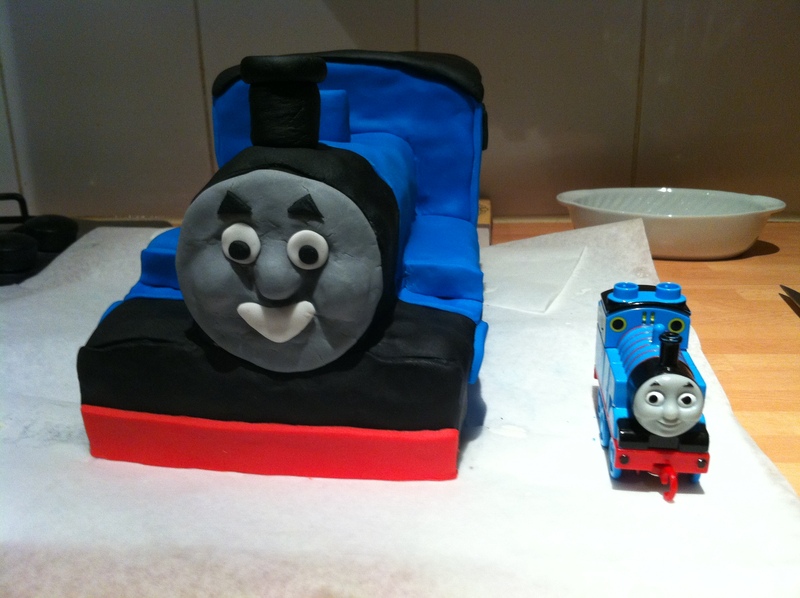 Here’s how the front turned out, and how Thomas looks after being crumbed. After this was done, things got serious. I has coloured the fondant I was using already with gel colourings, but the nerves kicked in, so I went browsing for some online assistance. 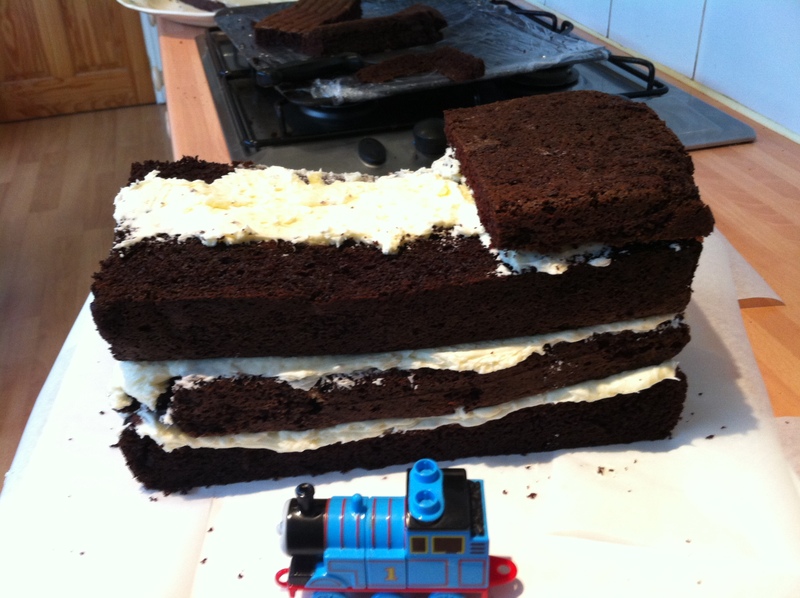 I found this amazing Thomas the Tank Engine cake tutorial (why, oh why didn’t I do this before carving) which outlines both how to construct the cake, and how to make Thomas’ face. Thanks to Wendy for this and you can find her tutorial here. 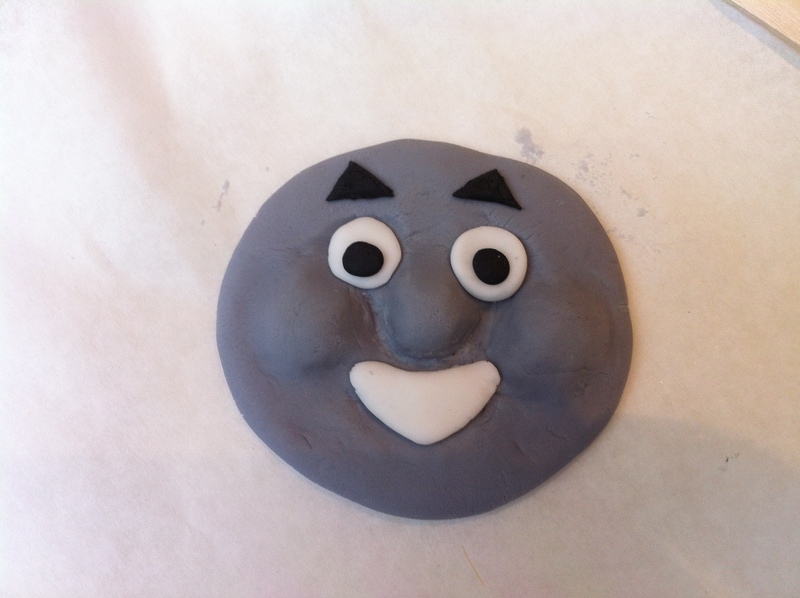 The tutorial is particularly good on how to make the face, and a good tip too to freeze the cake to make it easier to carve, something I didn’t do. Gradually I built up the layers of fondant, and slowly the whole thing started to look right. I think he looks a bit creepy with no face, so I put the face on next and finished with all the red and yellow bits. You might notice that he isn’t quite anatomically correct, but enough so that I could live with it. OK – an aside – I am in the process of ordering some cake modelling tools, so I promise in future that some of those sloppy joins will disappear! 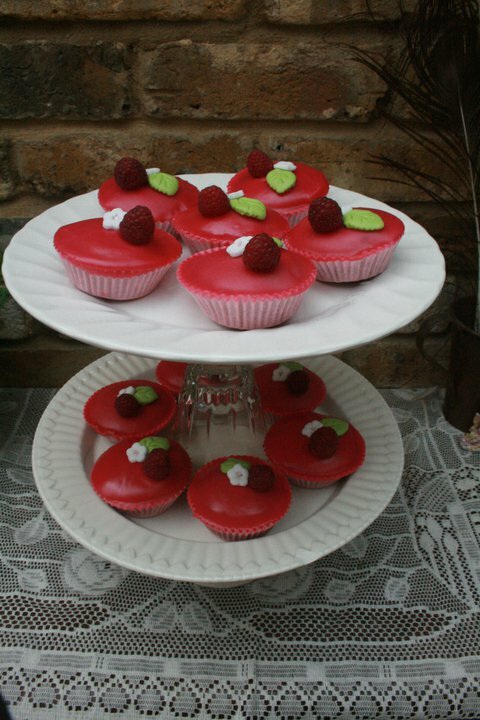 But I am certainly getting better with the fondant. Perhaps I could have taken a little more care with the carving – he certainly has a lean, maybe he’s just taking a sharp corner? A few weeks ago a lovely friend of mine had a birthday. Hmmmm…. what to bring to the party? I know! A super-moist chocolate mud cake. 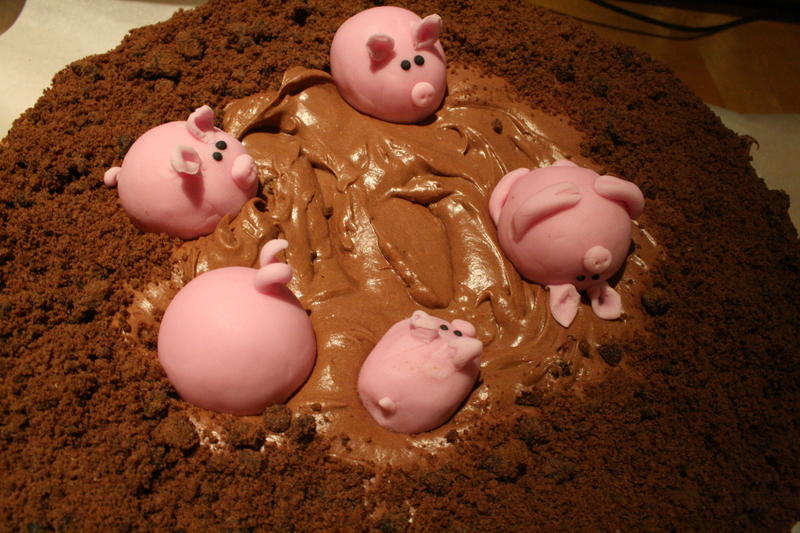 Complete with chocolate fondant covered pigs, whipped chocolate ganache frosting and chocolate sand! I had seen a chocolate cake with pig decorations before – and with the use of google images found some amazing cakes to base this one on. 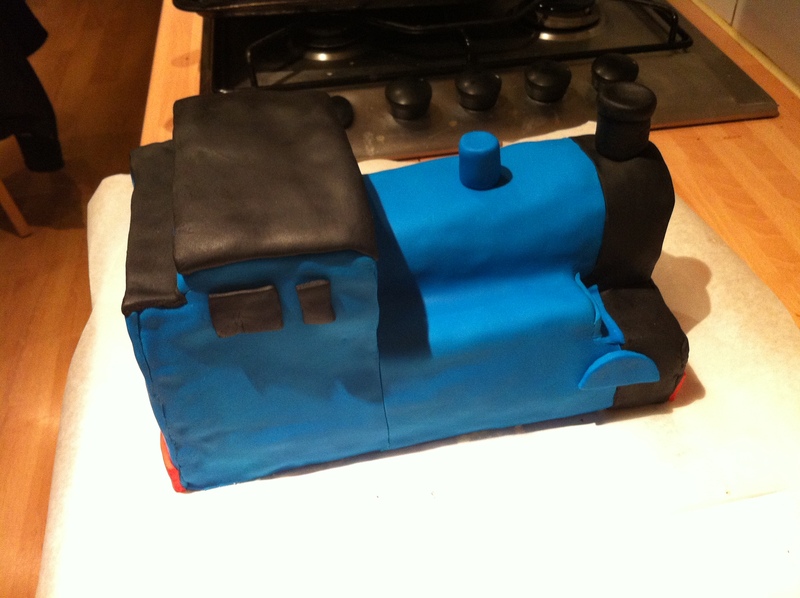 (Thanks fellow cake makers!) I think it turned out quite well. Here’s how I did it. To make the whipped chocolate ganache: break up 300g of dark chocolate into a heatproof bowl. Meanwhile, heat 300ml of double cream to a simmer point. Then pour the hot cream over the chocolate. Wait for a while and then stir until the chocolate is melted completely. Then whisk on a medium speed until its fluffy enough for ya. To make the chocolate sand I bought the driest and crumbly-est chocolate cookies I could find (mine were chocolate chip – you can see the chips in the photo) broke them up and put them in a food processor for a quick blitz until they transformed into chocolate sand. Magic! Now, the pigs. 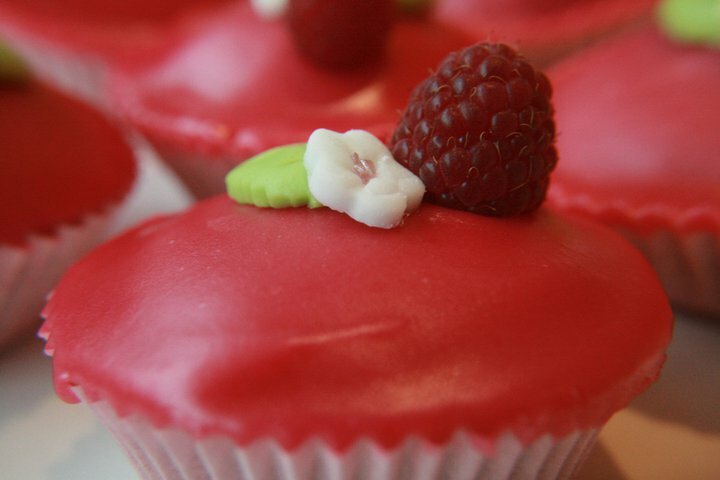 I love the look of sugar craft decorations on cakes – there is some amazing work out there – but I don’t always want to eat these amazing creations. 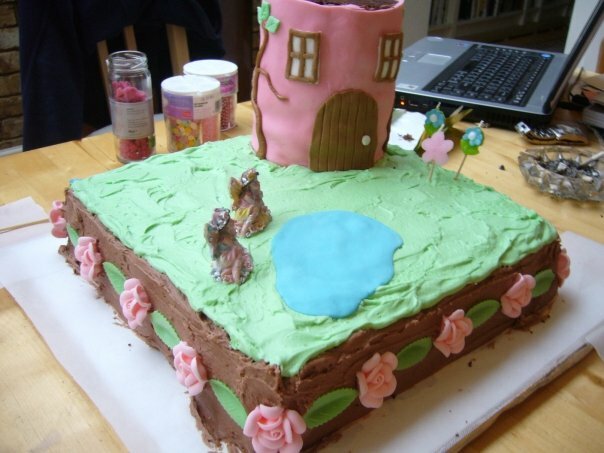 That’s just too much sugar paste or fondant, and to me it can ruin the taste of the cake. So these little piggies contain a surprise. A Lindt chocolate ball of joy in the centre. 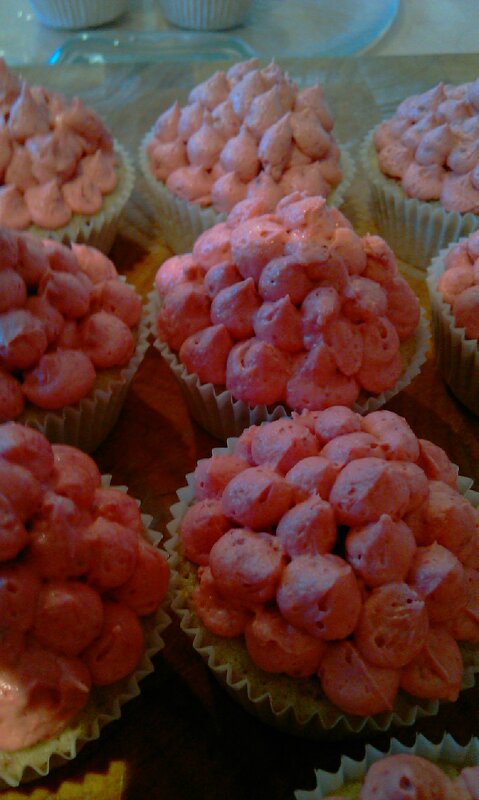 I just colored some ready made sugar fondant pink, rolled it out and cut out circles to wrap the chocolates in. Pinch the edges together and then roll them around in your palms for a bit and they smooth down quite nicely. Ears are little triangles, noses just a blob, and tails tiny little snakes rolled between your fingertips. Two small black frosting eyes – and done. The cake is sandwiched with more whipped chocolate ganache. It tasted pretty darned good, and the surprise chocloate pigs stole the show. It’s moist. So, so moist. And choclatey. The recipe makes two 10-11 inch cakes. 1. 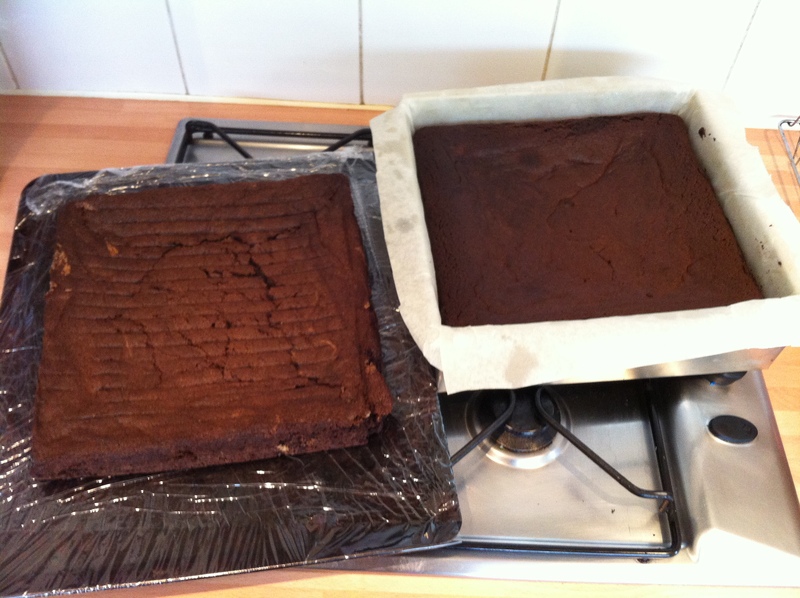 Pre-heat the oven to 180C or 350F and prepare two 10 or 11 inch cake tins with baking parchment. 2. Sift dry ingredients together. 3. Cream butter and sugar until pale and fluffy. 4. Gradually beat in the eggs. If it looks like curdling add two tablespoons from the flour mixture. 5. Fold in the flour mixture, and creme fraiche, alternating between the two -starting and ending with the flour. 6. Divide evenly between tins and gently encourage the mix to the sides. 7. Bake for 30-35 mins, until they smell ready and a skewer comes out clean. 8. Let cool 5 mins in tins, then turn on to a wire rack to cool. 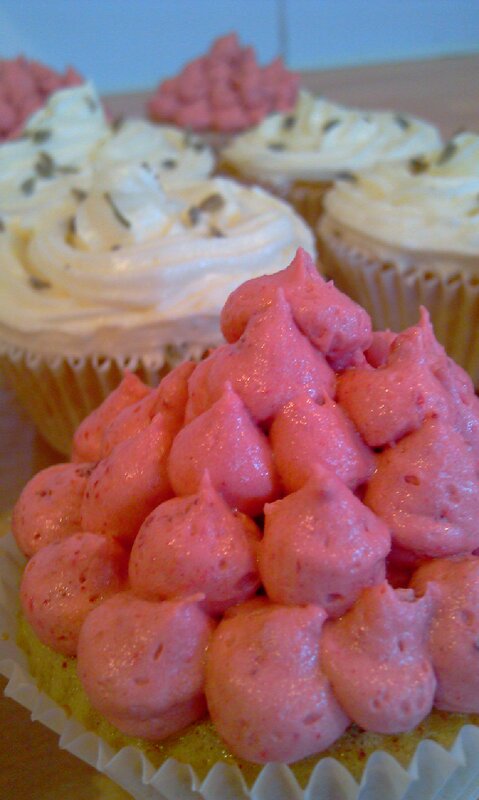 This is the cream cheese frosting that goes particularly well with the carrot cake recipe of my last post. This does make quite a lot, but it can be frozen (make sure its airtight) and will be good for 1-2 months. Bring to room temperature slowly, and re-whip before use. It can also be stored in a refrigerator for a couple of days – again, bring to room temperature and re-whip before using. 1. Beat cream cheese and vanilla on medium speed until creamy. gradually add butter until fully incorporated. 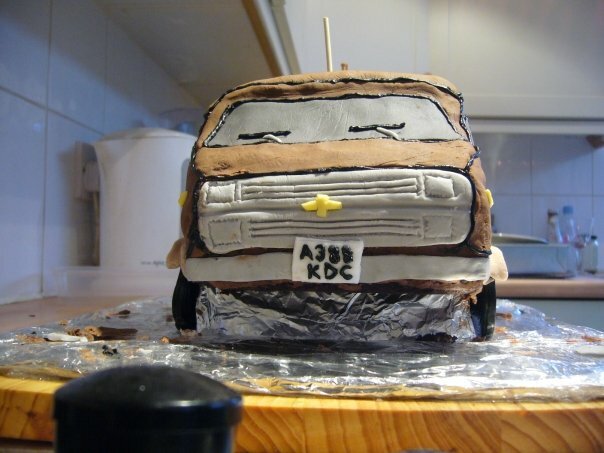 About three years ago I started playing with fondant icing. The results? Some ok looking cakes, but certainly room for improvement. 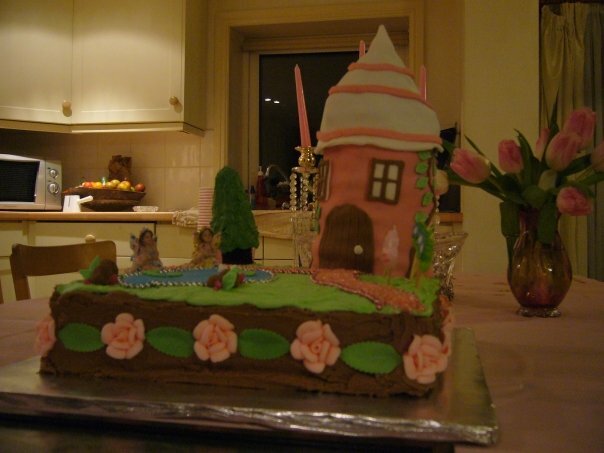 The first was a cake for a friends fairy birthday party. I can’t even remember what type of cake is under all of that – I think chocolate. The base was simple, butter cream frosting. – the tower was a lot more difficult. Layers of cake held together with butter cream – I seem to recall using a lot if wooden skewers for structural integrity. 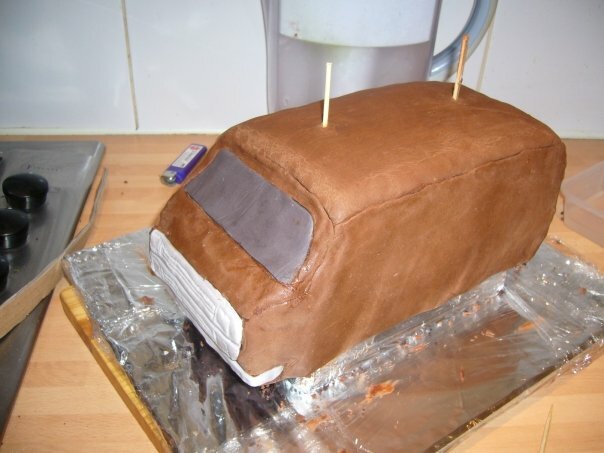 Here is the cake part way through. Despite the skewers, the tower looks wobbly. Again, store bought wafer leaves, and store bought fondant flowers (this was before I had discovered moulds). A lot of fun, but quite time consuming. 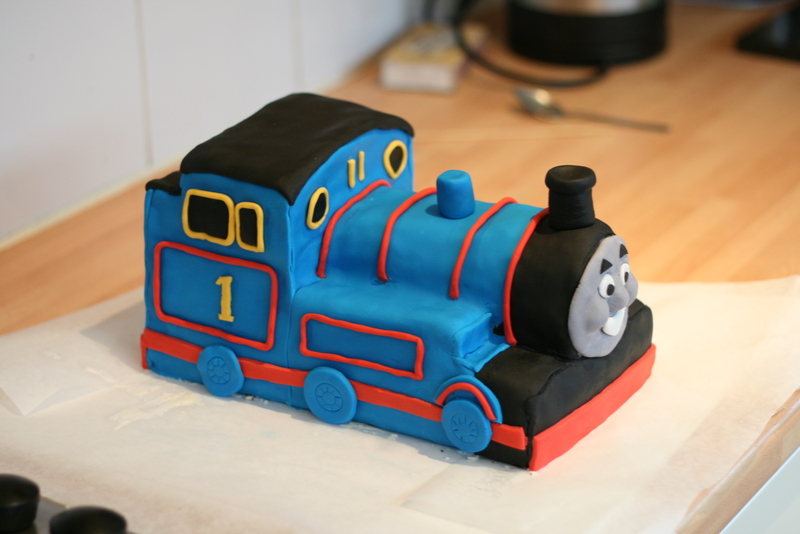 My second attempt at fondant was for another friend’s birthday. At the time he had a van. Love the skewers. Anyway, this one was an easier shape for sure. 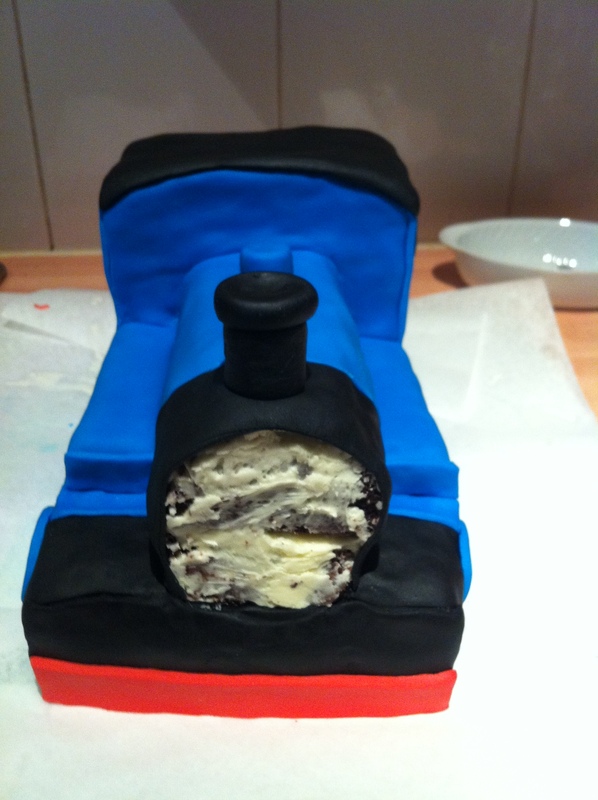 Looks like my piping needs some work!